After an absolutely abysmal 2011, uranium miners and the radioactive commodity itself have performed exceedingly well to start off 2012. A primary cause of the 2011 weakness was the Japanese nuclear catastrophe, which hit the industry’s immediate and future demand projections, followed by some expectations that much of the third world may slowly abandon the power source. Shortly after the Japanese nuclear issue, Germany indicated that it would reduce its use of nuclear power and slowly eliminate it. Expectations of additional similar policy decisions, coupled with rapidly falling natural gas prices, rendered nuclear power an unloved source of energy. As a result, the uranium prices fell, as did the equity of uranium miners. Several of the uranium miners and producers, like the commodity itself, producers started 2012 with a vengeance, dramatically outperforming the strength seen in the broader market. Much of this strength appeared to be inspired by a short-term bidding war that broke out between Cameco Corp (CCJ), a uranium miner, and Rio Tinto (RIO), a large and diversified mining company, over Hathor, a Canadian uranium miner. Rio Tinto ended up winning the war and Hathor, but the competition for its uranium mining assets indicated these competitors recognized potential future demand and/or price increases for the commodity. Such increased demand could potentially come from the emerging power needs of China, India and many other growing nations with growing needs for power. Both China and India have announced ambitious multi-year nuclear development plans, with China planning to increase its nuclear capacity eight-fold by the end of the decade, and India planning to increase its production thirteen-fold. Other nations within Asia and Southeast Asia may follow the lead of the larger ones. Below are listed several companies with business substantially relating to uranium mining and/or production: Cameco, Denison Mines (DNN), Uranerz Energy (URZ), Uranium Resources (URRE) and USEC (USU). I have included their 1-week, 2012-to-date and 1-year equity performance rates. 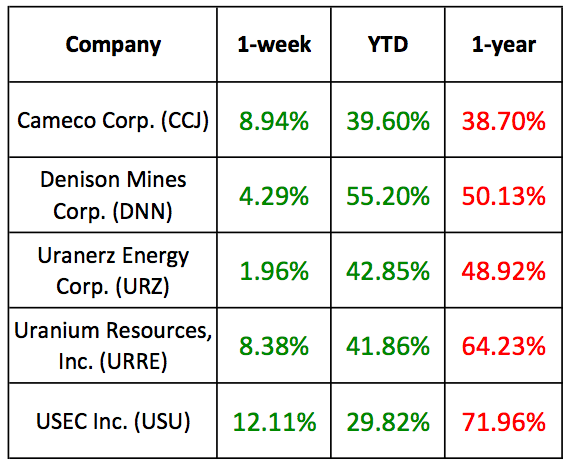 These stocks are now up an average of 41.87 percent so far in 2012, and 7.14 percent just last week. Nonetheless, they are all down compared to one year ago, and on average down by 54.79 percent. It is possible that uranium demand from new and sizable locations such as China and India, will soon outpace uranium supply, possibly creating dramatic shortages and price spikes to both uranium and the shares of uranium producers. Of course, it is also possible that thorium could replace uranium, or that some new power source might make uranium based reactors obsolete. It should be expected that this industry will continue to exhibit high risk/reward characteristics, and that investment allocations should be limited accordingly. Disclaimer: This article is intended to be informative and should not be construed as personalized advice as it does not take into account your specific situation or objectives.